This is a list of films produced or filmed in Luxembourg, including numerous films made for television in the country. Many of them may have been co-produced with Germany, France or Belgium. Bernard Bloch is a French actor and theatre director. 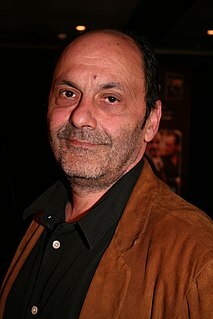 Jean-Christophe Bouvet is a French actor, film director and writer. Élodie Navarre is a French actress. Navarre was discovered at 16 when she was spotted on the Paris metro by a casting director and, a year later, appeared in the television film Clara et le Juge. She studied at the Conservatoire d’art dramatique in the 10th arrondissement of Paris and, aged 20, began her professional career as an actor, appearing at the Théâtre de la Criée in Marseille. When she was 22, Navarre suffered multiple fractures after being hit by a car while on holiday in Greece, taking a year to recover. She has since appeared in theatre, film and television. Marie Kremer is a Belgian actress. Her first leading role was in the 2003 movie I Always Wanted to be a Saint ., for which she won the Créteil International Women's Film Festival's Female Talent Award. After that, she played in St.Jacques-La Mecque, a film about a group of people on their way to Santiago de Compostela. She is also to be seen in Caché, and also in Ravages, a film from Christophe Lamotte, Blame it on Fidel and Beneath the rooftops of Paris. In 2012 she was nominated for the Magritte Award for Best Supporting Actress. Olivier Py is a French stage director, actor and writer. Simon Njami is a writer and an independent curator, lecturer, art critic and essayist. Julia Thurnau is a French-German actress and artist. She grew up in a village close to Cannes, later moved to Munich where she did acting studies at the Schauspielstudio München, then actors training at the Ernst Busch acting school Berlin. Vincent Elbaz is a French actor. He has appeared in many French television shows and films. Erick Benzi is a French musician, songwriter, composer and record producer. Bruno Putzulu is a French actor, born in Toutainville. Lorànt Deutsch, is a French actor and writer.